Flip Out Mama: Check Out Game Time: Tackling The Past on NBC Saturday, Sept 3! 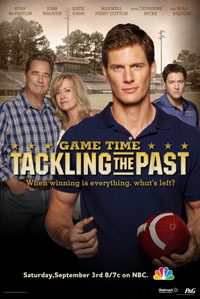 Check Out Game Time: Tackling The Past on NBC Saturday, Sept 3! Walmart and P&G are at it again! Teaming up for another Family Movie Night this Saturday, Sept 3, at 8PM ET on NBC! The movie this time: Game Time: Tackling the Past! What a perfect movie to usher in the Fall Football Season! Synopsis: Pro football star Jake Walker is living the dream… or so he thinks. The veteran tight end is a fan favorite and on pace to set the all-time receiving yards record that will guarantee him a spot in the Hall of Fame. While working out at training camp, Jake receives an unexpected call from his brother Dean – their father Frank has suffered a major heart attack. Jake immediately leaves practice and returns to Riverton, North Carolina, the small hometown he’s avoided for nearly 15 years. Memories of glory and regret flood his mind as he returns to the family and friends he abandoned in pursuit of his career. Jake dutifully visits with Frank and Dean, but hurt and misunderstanding from the past begins to resurface, leaving him counting the days until he can return to his team. A second unexpected call, this time from his agent, delivers Jake another crushing blow. His contract is not being renewed amid concerns about his surgically repaired knee. Suddenly, the life Jake knows is over. To avoid the media circus around this news, Jake reluctantly decides to extend his stay in Riverton. Attempting to make the best of the situation, he begins reconnecting with the community that once revered him. Jake is reintroduced to Sarah, his high school sweetheart, and helps Dean take over their father’s high school coaching job. Surprisingly impacted by the people around him, the real Jake begins to emerge from behind his armor to see that life is much more than the accumulation of personal stats. But when Jake’s offered a lucrative new contract to play for another team, he is forced to decide whether to go back to the career he thought he loved, or stay in Riverton and embrace the people who always believed in him. I knew my boys would really enjoy this movie! I was right, they were in to it all the way until the very end! Even though it was a football movie, it has a great story line and definitely kept Mom entertained too! I love the fact that when Walmart and P&G get together for Family Movie Night, it's always a good movie that my whole family can watch together! We always have a hard time getting something for everyone, but this one was perfect! Family Movie Night has come out with a ton of great movies in the past, and this one is no exception. The point behind Family Movie Night is to bring families together and get everyone talking about movies with a great message behind them!Make sure to join Family Movie Night on Facebook to stay up to date with all their latest productions! I think we are going to watch the movie again this Saturday! Don't forget to check it out at 8pm ET, on NBC!